UK police are trying to remove an Islamic State travel guide from the internet, which offers would-be jihadis advice on how to reach Syria to join the group, from what to pack for the trip to how to elude Turkish authorities. The manual has since been deleted from several webpages, including JustPaste.It and Scribd. Its release comes amid reports that three London schoolgirls boarded a flight to Istanbul to sneak into the “caliphate” to join ISIS. 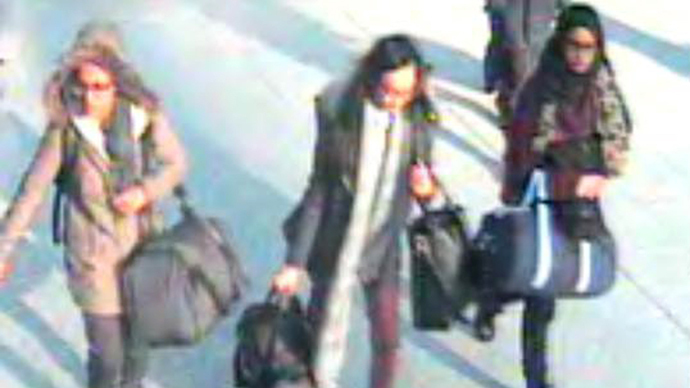 The teenagers, Shamima Begum, 15, Kadiza Sultana, 16, and Amira Abase, 15, have reportedly entered Syria after having been lured in by ISIS propaganda. “People who leave to get to Syria do not tell anyone, not even family. Travelers to Syria usually want to reach Turkey. But for safety reasons, they buy a ticket for an indirect holiday country like Spain or Greece so their destination doesn’t seem suspicious,” the guide says. It also suggests they buy a return ticket to avoid suspicion. Asked about the guide, a Scotland Yard spokesperson told The Guardian: “It’s of interest to the CTIRU [Counter Terrorism Internet Referral Unit] and we have and we will seek its removal from websites and social media platforms.” The unit scours the web for terrorist publications. The e-book offers tips on how to dress in a non-religious fashion so as not to arouse suspicion. “Lately things have got harder at the Turkish border, so Islamic State members often meet new people in Turkey hotels and smuggle them across the border,” it states. The militant group, which seized large swathes of Iraq and Syria last year, has launched a full-scale social media campaign, using it as a recruiting tool for jihadis from nations including the UK, France, Germany and the Balkans. The group’s notorious ‘Jihadi John’ has now been identified as Mohammed Emwazi, a British man from West London. He appeared in several ISIS videos beheading foreign hostages – first in August 2014, when US journalist James Foley was killed. In December, the group published a gruesome guidebook for its fighters on how to buy, sell and abuse captured girls – even if they have not reached puberty. The manual in Arabic, titled “Questions and Answers on Taking Captives and Slaves,” was circulated on the Twitter accounts of senior IS leaders. Twitter has continued its efforts to suspend accounts linked to ISIS.